Forage Fish - Kepley BioSystems Inc.
It’s not so easy being the little guy. Often overlooked, forage fish play a vital and expanding role not only in the oceanic ecosystem, but the future of humanity itself. Forage fish don’t get a lot of love. They have never ranked among the most desired fish in the ocean. Few people have ever taken a celebratory selfie on a pier with a prized menhaden dangling from their hook. There are literally thousands of them swimming together at a time and their numbers are not nearing the extinction levels sharks or dolphins. Why then are stories about forage fish suddenly appearing in the news? Why are conservation and recreational fishing groups beginning to lobby for stricter catch restrictions on forage fish species? Quite simply, because forage fish might be the most important fish in the ocean, and without them, we would be in a lot of trouble. Forage fish, such as menhaden, herring, sardines, and anchovies, are small fish just a few inches long. Due to their small stature, they typically travel the ocean in large groups, known as schools, which act as larger unit for protection. It is their abundance and availability that make forage fish a “keystone species”, since the majority of ocean life depends on them for sustenance. In the food web, forage fish play a very important role known as “secondary consumers”, in that they convert stored energy from primary consumers, such as plankton and algae, into energy that can be transferred up the food chain. Without these small but mighty forage fish, this energy would be entirely unavailable to higher pelagic species. 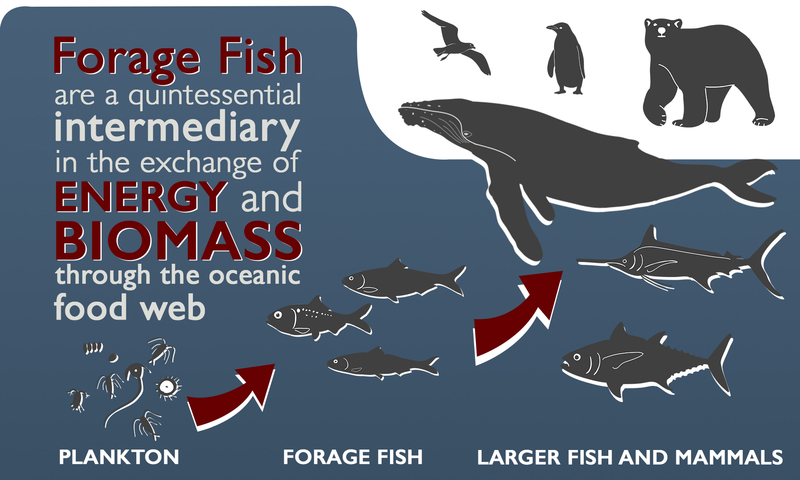 In other words, forage fish eat the most plentiful source of food available (plankton and algae) and then this energy is transferred to bigger fish, marine mammals, and seabirds who eat forage fish. This process is so important that it takes almost half of the world’s biomass of forage fish to sustain all of these higher pelagic species. The importance of forage fish in the oceanic ecosystems is undeniable. By feeding on primary consumers such as plankton and algae, forage fish move both energy and biomass up the food web when they themselves are eaten by larger predator. Most ecosystems have at least one predator that is entirely dependent on forage fish for sustenance. As forage fish stocks dwindle, the pressure is felt through the entire food web. The industrial net-fishing industry catches and resells up to one-third of these wild forage fish for the sole purpose of catching other fish, crabs, and lobsters (global bait industries). Mounting industrial demand, accelerated by a growing body of research extolling the virtues of these tiny nutritional dynamos, appears to be entirely unsustainable. Industrial net fishing results in 35 million metric tons of forage fish captured per annum. 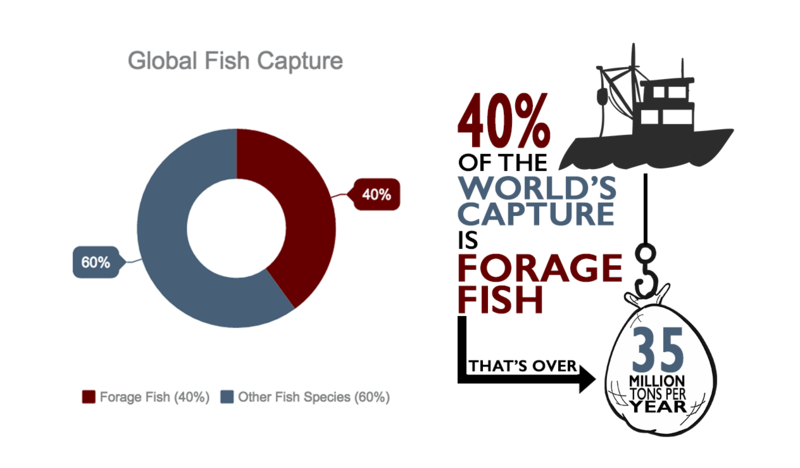 Nearly 40% of the total fish captured globally are forage fish. 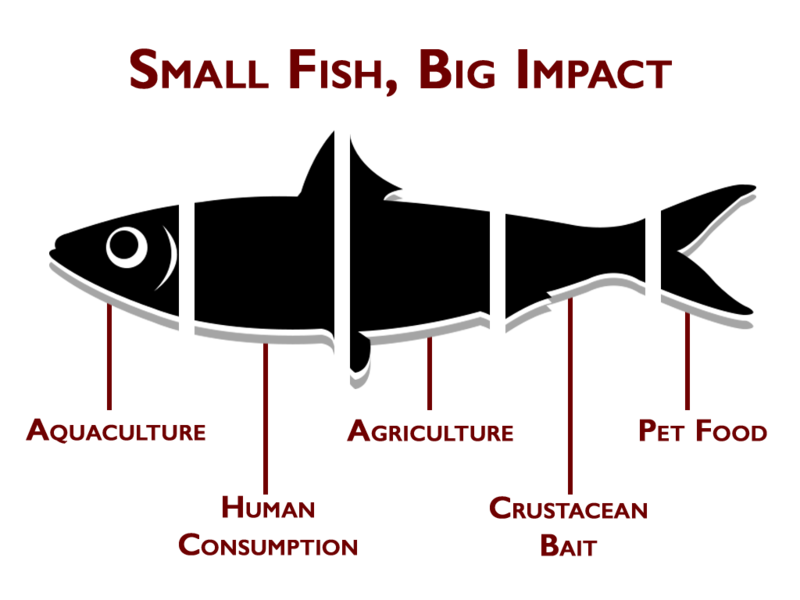 These fish supply numerous industries, including agricultural additives, pig and chicken feed, pet food, fish farming (aquaculture) and Omega 3 supplemental oil (with well-documented, collateral loss of dolphin and other unintended by-catch). Second only to the importance and biomass of plankton, forage fish also provide the sole food source for many other fish, mammals, and birds in every region of the world. 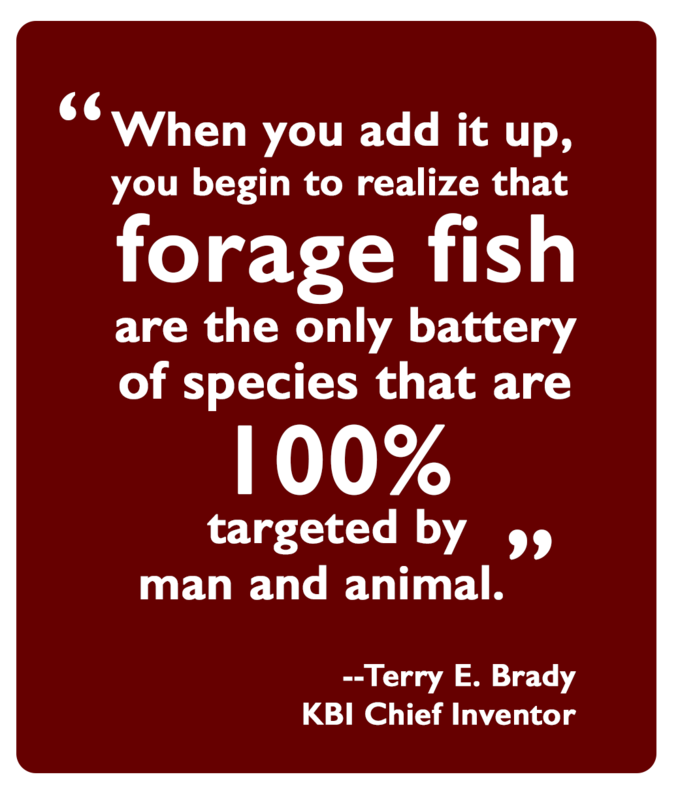 This effectively makes forage fish the only species on Earth that is 100% targeted by both man and animal. However, we have a huge advantage over our animal rivals when it comes to catch rates. Using exploitative seine net practices, industry can target these fish while schooling, catching thousands of pounds at a time, which can also result in the destructive by-catch of protected species. Currently, with little to no regulation on these fish, we are removing them from the ocean at an unsustainable rate. Forage fish numbers are declining rapidly, as they are unable to reproduce at a rate that meets the ecological and industrial demand. Evidence of this has already been reported close to home. For over a year, sardine fisheries on the U.S. West Coast have been placed under a complete moratorium, which is expected to remain in effect through 2017. According to the National Oceanic and Atmospheric Administration, the biomass of reproductive adult sardines is well below the level that allows the fish to maintain healthy population numbers. This has resulted in wide ranging effects, including the death of over 70% of the newborn sea lion population and high rates of nest abandonment experienced by the brown pelican. Sea lion and pelican mothers rely on forage fish to gather and produce nutrients for their young, and with the sardine population dwindling, they cannot find the food needed to feed their young. While this is one example, the principle applies to every oceanic ecosystem on Earth, since they all contain predators, such as sharks, dolphins, turtles, and seabirds, that depend heavily, if not exclusively, on forage fish for sustenance. 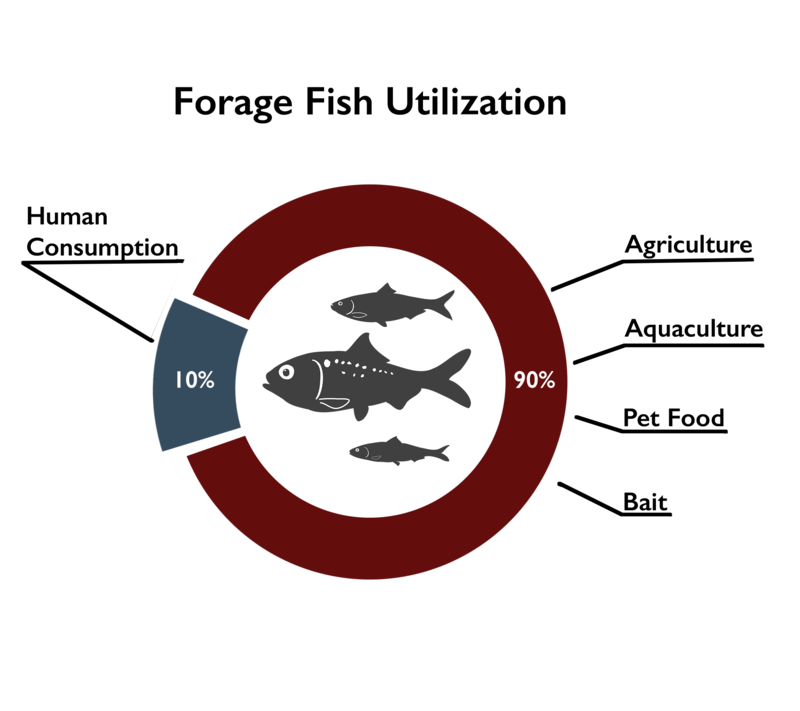 As the availability of forage fish goes down, the populations of these predators soon follow. Furthermore, as humanity’s population and the global middle class rises, fish protein will be vitally important to feed our own ever-growing numbers. As of 2015, fish has surpassed beef as the number one consumed protein globally. Thus, forage fish will become increasingly important to protect given that their populations are closely tied to species like tuna and salmon that are prevalent in human diets. Commercial forage fish fisheries have an annual total worth of $5.6 billion, but when left in the ocean, the value of forage fish to grow other fish markets and fisheries places their worth at over $11 billion, demonstrating that their usefulness is far greater when left in the water. As we turn to aquaculture to satisfy some of our global protein demands, it is important to remember the efficiency of protein transfer. Aquaculture is easily the most efficient farm-grown protein, providing a lower feed to meat ratio compared to beef, pork, and chicken. For instance, 1.5 pounds of feed are required to produce 1 pound of farm-raised salmon. Since forage fish are a requisite part of that feed to provide salmon with the nutrition and omega oil they need to grow, we will use more forage fish to feed farm-raised fish than we get in return. 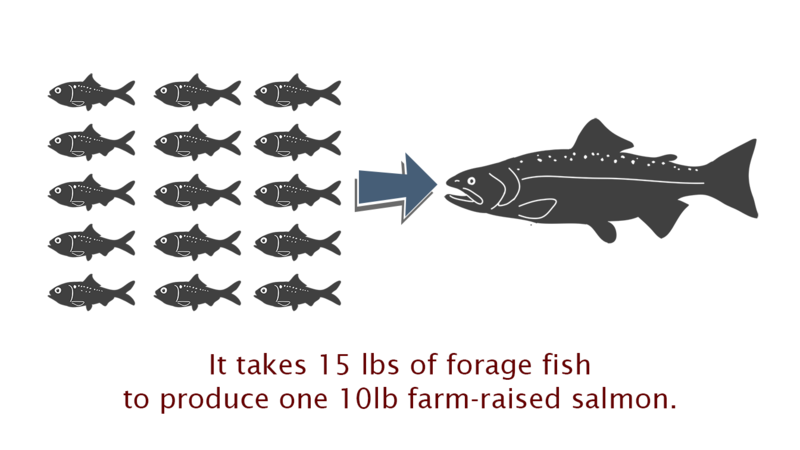 Aquaculture requires 1.5 lbs of forage fish protein for each pound of salmon meat produced. While this ratio is far better than other forms of farmed protein (beef, pork, and chicken), it is still not an efficient solution. Efforts have been made to begin protecting forage fish populations through fishery regulations, but more thought and effort must be made toward ensuring the health of forage fish numbers. As a keystone species, forage fish are a bellwether for the overall heath and wellness of the ocean. Therefore, for the future of the ecosystem, and ourselves, we must improve our conservation efforts and come to terms with the fact that wholesale removal of these fish from the ocean results in a net loss. The Lenfest Ocean Program invests in scientific research on the environmental, economic, and social impacts of fishing, fisheries management, and aquaculture. Supported research projects result in peer-reviewed publications in leading scientific journals. The Program works with the scientists to ensure that research results are delivered effectively to decision makers and the public, who can take action based on the findings. The program was established in 2004 by the Lenfest Foundation and is managed by the Pew Charitable Trusts. Pew works to promote an ecosystem-based approach to fishery management along the U.S. West Coast by making sure we leave enough forage fish in the water as critical prey for marine wildlife, protecting ecologically sensitive areas, and reducing the number of animals unintentionally killed in fishing gear, commonly referred to as bycatch. Oceana is working at state and federal levels to improve management of existing fisheries targeting three of the top forage species off the U.S. West Coast (sardines, anchovies, and herring) and to prevent the development of new fisheries for forage species unless and until science can demonstrate that these fisheries may be conducted without harming the ecosystem. The Marine Fish Conservation Network is a coalition of commercial and recreational fishing associations, regional and national conservation groups, aquaria, and marine science organizations committed to sustaining fish populations, healthy marine ecosystems, and fishing communities. The Network is committed to ending overfishing, rebuilding fish populations, and fostering a fisheries management system that protects vibrant marine ecosystems and the thriving local communities that depend on them.